Mamak draws crowds so it may not be the best choice if you’ve only got 10 minutes for lunch – but it’s a winner if you only have $10! Get six chicken or beef satay sticks for $9, the rice and curry dish nasi lemak for $9 or the flat bread and dipping sauce combo roti telur bawang for $7. If pizza is your thing and you’d like some good atmosphere while you eat it, head to the mostly outdoors Ryan’s Bar. It’s a common haunt for business types and you can choose from a margherita, pepperoni or ham and pineapple pizza for just $10. 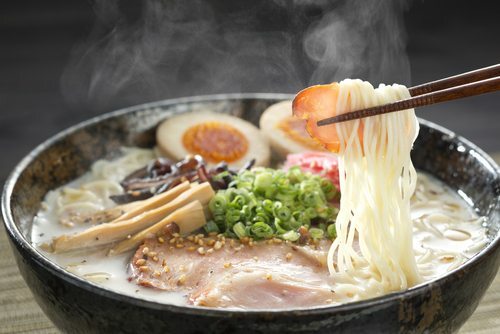 Try one of Japan’s most widely embraced (and cheapest) dishes – the delicious noodle, meat and broth combination that is ramen. Most places offer ramen for under $10, just wander through Haymarket and you’ll find a spot! However, Menya is frequently touted as one of Sydney’s best and you can judge for yourself for $9.90 with the Menya Ramen, Hakata Tonkotsu Ramen or Wafu Shoyu Ramen. Get a little gourmet fix on the cheap by visiting Chow, run by chef Chui Lee Luk, previously of Claude fame. Have veal shin, onion and black fungus rolls for $9, deep-fried sticky pork dumplings for $8 or sweet pork and taro fingers for $7.50. And we know we said there wouldn’t be any hot dogs, but Old Joe’s gourmet hot dogs truly deserve a mention! This is a foot long affair with house-made pickles, tomato relish and mustard – plus a generous side of fries and coleslaw only for $10.